Over the offseason, ownership decided it was time to import a new front office. Led by Andrew Friedman, Farhan Zaidi, and Josh Byrnes, the Dodgers are set to make shrewd moves with a gigantic budget. Upon arriving, Friedman and crew performed a roster makeover. They added Howie Kendrick, Jimmy Rollins, Yasmani Grandal, and several pitchers. Outgoing names include Matt Kemp, Dan Haren, and Dee Gordon. The lineup is stout from top to bottom, and it's deep too. The rotation could be a strength. Just watch out for injuries. If there is a weakness, it's the bullpen. The top gun is on the disabled list for at least a month, and the alternatives are decidedly ordinary. Wouldn't it be nice to be the undisputed best pitcher in baseball? 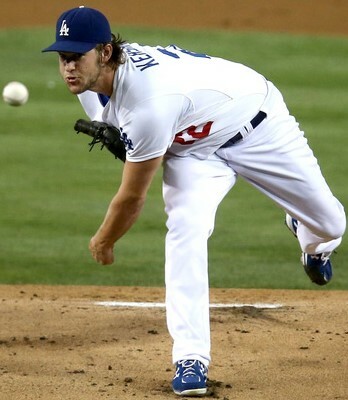 Kershaw racks up strikeouts with a simple three pitch repertoire. Every year, there is talk of incorporating a changeup, but it never happens. His 93 mph fastball is above average. His best pitch is a lethal slider. It comes equipped with a near-30 percent whiff rate. His curve is a plus pitch as well. The entire package plays up due to great command and control. But you knew all that. In case Kershaw wasn't enough, the Dodgers have a second top 15 pitcher in Greinke. He has a five pitch repertoire with a plus-plus 92 mph fastball, sinker, change, slider, and curve. After the fastball, his best pitches are the change and slider. Like many starters, the sinker is by far his worst offering. Last year, he posted a 2.71 ERA, 9.21 K/9, and 1.91 BB/9. He's the 10th overall pitcher, so you'll have to use an early pick to acquire him. McCarthy is a personal favorite of mine, and it was gratifying to see him pitch well in New York. With a high ground ball rate, tolerable strikeout total, and excellent command, he should be a reliable target. You'll still need to work around the 7.88 K/9, and that's assuming he can maintain his 2014 breakout. He reached a career high in innings pitched by a wide margin after a long career of lost seasons. I actually had the opportunity to discuss his workout plan with him. I'm mildly hopeful that it's responsible for his health. His average ADP is 239, so he's a useful Plan D.
Normally, I'd be all over Ryu. He seems underappreciated in fantasy circles. With about 8.00 K/9, 2.00 BB/9, and an ERA just north of 3.00, he's a useful core performer. Alas, a shoulder injury has his season in question. Tests have shown no damage, so he'll rest a few weeks and resume. He'll need to fall beyond his listed ADP of 173. Joe Wieland is a finesse pitcher with some upside. Injuries have prevented him from becoming established as a back of the rotation candidate. He should get a chance to fill in for Ryu, but fantasy owners can probably sit out the audition. The Dodgers signed Brandon Beachy while he recovers from his second Tommy John surgery. We could see him around midseason. Just don't bet an immediate rebound. Other names to watch include Zach Lee and Carlos Frias. Jansen is due to miss about a month of the season with a foot injury. When he's healthy, he's the nearest thing to Mariano Rivera since…well…Mariano Rivera. Nearly 90 percent of his pitches are classified as 94 mph cutters. The remaining 11 percent are split between sinkers and sliders. The whiff rate on his cutter is a ridiculous 17.13 percent. That's elite for any fastball. Because they're so unexpected, the other two pitches are even better. There isn't much behind Jansen. Peralta is probably the safe option. He's a low ceiling, high floor choice to patch the ninth inning. Hatcher is a better alternative if he can replicate his 2014 season. Pitching for the Marlins, he allowed a 3.38 ERA with 9.64 K/9 and 1.93 BB/9. He has the stuff to close – namely a 96 mph fastball, average sinker, plus slider, and plus splitter. All the same, I suspect he'll pitch the eighth. The Dodgers have remained non-committal. With Hanley Ramirez and Kemp in new homes, Yasiel Puig is the undisputed leader of the Dodgers' offense. The 24-year-old has flashed top five overall upside. He ran into a mechanical funk for a long stretch of 2014. Even so, his season line was .296/.382/.480 with 92 runs, 67 RBI, 16 home runs, and 11 steals. That compares favorably to just about anybody not named Trout. He's the 10th outfielder off the board. Pick 25 is a fair price. Following Puig is veteran first baseman Adrian Gonzalez. If you're looking for RBI, he may be the most consistent producer in baseball. He's driven in 99 or more runs in each of the last eight seasons. All good things must end, but he should have a few productive seasons left in the tank. With high OBP Puig ahead of him, another 100 RBI campaign is well within reach. Since there are signs of skill decline, his ADP has dropped to 49th overall. Newcomers Rollins and Kendrick are likely to play prominent roles in the offense. Rollins may lead off despite a weak OBP. He's a source of sneaky value with the ability to offer tolerable production across all five categories. The overall picture is similar to Alexei Ramirez, except Rollins is available 60 picks later. Kendrick could fill a mid-order position. His high average and decent OBP skills make up for low home run totals. He's stolen 14 bases in four of the last five seasons. Joc Pederson is somehow flying under the radar. Any other spring, a five category rookie with six home runs and a .368/.400/.754 line would be flying up draft boards. Instead, he's overshadowed by the exploits of Kris Bryant and Mookie Betts. He's the 47th outfielder (178 overall). There are obvious flaws – in fact he profiles as a slightly lesser version of George Springer (37th overall). If you're willing to absorb Springer's strikeouts, you should be happy to do so 140 picks later with Pederson. Grandal's career has been interrupted by injuries, a PED suspension, and a terrible San Diego offense. It will be interesting to see what he can do in L.A. Last season, his .225/.327/.401 line with 15 home runs was above average for a catcher. This year, I'm modestly hopeful for a little more power. Something like .245/.335/.445 and 20 home runs is possible. He'll also chip in with better run support. He's generally the last catcher in shallow 12-team leagues. He's a great buy-low candidate in two catcher formats. The Dodgers are the second team in our power rankings. The club is characterized by smart off-field leadership, reliable veterans, and plenty of depth. They're the proud owners of the best pitcher in baseball and one of the best young hitters. If they need to dig deeper than the current roster, they can call upon top prospects or trade for elite alternatives.